Paul McMahon is back in action for Peterborough Town this summer. Peterborough Town skipper David Clarke believes the ‘return of the Macca’ will propel his side to the Northants Premier Division title. 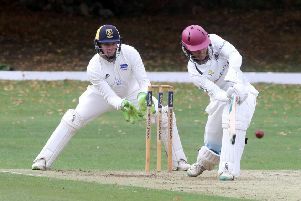 Professional Paul McMahon - a former Notts first-class player and current Cambs Minor Counties captain - is back at Bretton Gate after missing the whole of last season because of injury. Peterborough Town are expecting a strong season from Lewis Bruce. Town still finished second, albeit a long way behind champions Old Northamptonians, but that gap could be partly explained by the absence of McMahon’s all-round influence. “Having Macca back is a huge boost for us,” Clarke stated. “He’s not just the best spin bowler in the league. He bats well, he fields well and he’s a great help tactically to any captain. “There won’t be many teams at our level in the country who have such a well balanced bowling attack. We’ve kept fast bowler Joe Dawborn so the seam attack with Jamie Smith, David Sayer and Danny Mohammed looks strong and we have a second quality spinner in Lewis Bruce. “I’m expecting a big season from Lewis. He will bat in the top three and he will bowl plenty of overs. It’s then up to me to manage the rest of the team well. Peterborough Town skipper David Clarke in action. “I tinkered too much with the batting line-up last season. I want consistency this season. We didn’t bat too well last summer and it cost us. “The usual suspects will be up near the top. ONs were outstanding last season (they didn’t lose a game) while Finedon and Rushden will be hungry for success. McMahon’s return softens the blow of veteran Ajaz Akhtar’s Premier Division retirement and the departure of middle-order man Marcus Howard. Oundle endured a miserable top-flight campaign in 2017. A poor overseas performer and a lack of depth were partly responsible for a next-to-bottom finish. But Oundle have recruited former Leicestershire batsman Ben Smith as a paid player-coach. Smith made a favourable impression playing for Cambs last season. Oundle have alo signed South African Hanno Kotze for this summer, an explosive batsman accordin to new skipper Mark Hodgson. Town open their season at home to Wollaston on Saturday (April 22) when Oundle are at Brixworth.